Fine, soft, shiny, hair of the alpaca, a ruminant of the camel family which lives in the South American Andes, often at extreme heights of around 6000m. Its coat is a result of its adapting to its surroundings. Shearing is performed once every two years and only in part to ensure the retention of protection against the harsh conditions; exploitability is between 2kg and 4kg. 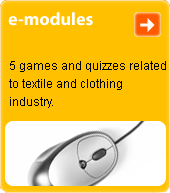 Used in the production of lustre fabrics and high-quality fabrics of carded yarn of the camel wool type. Fabrics produced from a. w. have the same name. Sometimes the term a. w. is used for fabrics produced from a. w.